I am pleased to quote about the visionary approach of the management of Shri SaraswatiVidyaPrasarak Mandal. The commendable initiative has been taken by Smt. 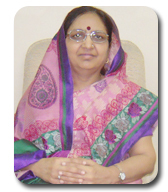 P.K.Kotecha Mahila Mahavidyalaya by providing opportunity to girl students to educate themselves. The vision of the college ahs resemblance with the Govt. policies that to uplift and empower women by giving them more facilities to take higher education. Every effort is done to sustain the quality and its enhancement. Leading a step ahead, the institution has availedwell furnished Seminar hall, Ladies room, Commerce Laboratory, M.Sc. computer Laboratory recently construction of second New Ladies hostel is in progress with UGC support. The management is always keen in maintaining beautification of the campus. Advanced courses such as M.Sc. computer, Biotechnology, M.B.M. are made available. To give exposure to hidden talents among the students, extracurricular activities are organized for all round development. I feel confident that This temple of knowledge will go as long way towards motivating and flourishing the talented students helping them to develop their qualities of citizenship and commitment to the community service as well. I hope this college will infuse a constructive thinking and a strong will among the students to achieve and to excel. On this occasion, I extend my best wishes and greetings to the Principal, teachers, supporting staff, students, and all the stake holders of the institution Good luck.